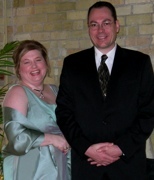 In October of 2006, Kim and I attended Kary & Mark's wedding. Kary is Kim's younger sister. Mark Clough is a fantastic guy, together they make a terrific couple. The wedding and reception took place at 'The Palms' bistro/bar in the historic third ward of downtown Milwaukee. For us it was a weekend getaway - the first wedding we've been to since 1996 - for them it's the culmination of a foregone conclusion. Congratulations to the lucky couple! As Kim and I celebrate our 21st wedding anniversary (on the 26th of October), we wish them as many years of happiness as we've had. Here are a few of the photos I took at the reception. I hope you enjoy this little layout. - Robert. ..and you respond by saying..
Did someone say Free beer!? Return to the Photos page / Return to the Front Door of Rob's World!